A University of Maryland freshman has become the 12th victim to die of complications from Adenovirus. Olivia Paregol has been named in reports as the student who died. The University of Maryland issued a letter acknowledging the death, though never naming anyone officially. The school’s health officials said that it learned that a student was sick with from a strain of the Adenovirus on Nov. 1. Another six cases of “Adenovirus-associated illness” have now been confirmed on campus. The school has also learned that one of the specimens sent to the Centers for Disease Control and Protection (CDC) was confirmed to be type 7 of the illness. Type 7 is among the most potent types, along with types 3 and 4, according to the CDC. There are more than 50 strains of the Adenovirus, a common virus found in the natural environment. 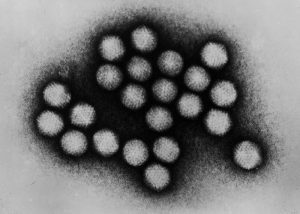 The virus generally causes colds and pneumonia, but some of the strains have been found to cause more serious illnesses. People who have compromised immune systems are particularly susceptible to life-threatening complications. There is no specific medication to treat the infection in a non-hospitalized individual. Early in the semester, Paregol, 18, reportedly developed a cough, which later worsened to pneumonia. She would have been at a higher risk of developing a serious illness because the medication she was taking to combat her Crohn’s disease weakened her immune system. Students on campus have now been advised to take preventive measures and departments across campus have begun an increased cleaning of surfaces around the University in response to the situation. Type 7 of the Adenovirus was found to be at the center of a viral outbreak that killed 11 children at a New Jersey rehabilitation facility. The Wanaque Center for Nursing and Rehabilitation has now stopped admitting new patients until the outbreak is over. It’s unclear how many people in total have died from type 7 Adenovirus in the United States in recent years.